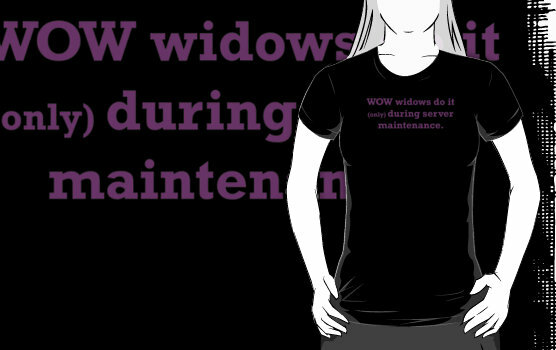 This entry was posted in Humour, Warcraft and tagged addict, downtime, server, wow by Typhoonandrew. Bookmark the permalink. My wife refuses to play WoW because she hates games where you have to run around killing things (but she loves Plants V Zombies). Often I have thought of a WoW spin-off in Facebook or possibly a new profession where you can level a toon without the need of dungeons and combat. Such professions could be chef- producing recipes for cooking; or animal farming – produce pets and mounts to sell to other players. The professions could work in a similar fashion to the Sims, where the player has to micro-manage the animal’s needs. heya ShaggyD, my wife is a non-gamer but loved playing games many years ago. I’ve been pondering what type of game would be casual enough for her to play on and off, and also interesting. Hard sell for that, and for some folks finding the right gateway-game (ala a gateway drug) is a mini-game in itself. The wow mini concept is a huge opportunity. The more I think about it, the more I think there is a large range of peripheral options that could help bring more people to blizzard’s services. Even if they do not end up subscribing to wow, there is benefit in having them looking at other products they could make. Specialising is good for the dev team, but how is an alternate Android/iOS game not a viable plugin? Funny as it is, I downloaded AngryBirds PC edition for the wife last night. The result? I had to cook myself and the little un our own meals… She was instantly addicted. What strikes me is how Blizzard have been slow to pick up the potential Warcraft could have with mini games which could be linked as achievements to the main game. The mini games could be played within the main game or as a browser. Warcraft already has the unique cartoon look, so it shouldn’t be too difficult. Additionally, the idea of mini-games (winnable pets?) could open the market to younger players (9-12 yrs) and also older generations who do not have the time to raid in the early hours of the morning (like myself). A missed opportunity I’d say.